Ok, so you’ve got a brand page on Google+; now you’re wondering how that will appear in Google’s search engine results. Last week I speculated it might be similar to how Google Profiles show up for individual users, but today I noticed this integration (screenshow below) of a Google+ brand page directly underneath the brand’s website. Note how the SERP pulls the posted G+ status updates right into the results page, as well the +1 counts and the number of comments for those posts. You can “add to Circles” right from the SERP if you’re logged in. This display isn’t limited to pages you’ve added to your circles, since it shows up even if you’re logged out. So far I’ve only seen this treatment for “verified” accounts, but not on every verified account. There’s been a lot of speculation about what will differentiate Google’s new social platform from Facebook, and why a brand would bother maintaining a separate preference. I think this is just the beginning of an aggressive push by Google to provide value to brands (or give a competitive disadvantage to brands that aren’t using Google+). I don’t recall how I responded at the time, but her statement got me thinking. Only later was I able to put my finger on why this didn’t sit right with me. Now that I’ve set up that scenario, you can probably articulate immediately the conclusion I came to later. Let’s compare notes after the jump. Driving requires knowing how to react to other cars… yes, even if they don’t follow the rules of the road. You have to be able to gauge how soon oncoming traffic will reach you, when you should turn, how quickly you’ll need to slow down or accelerate, whether that car at the intersection is likely to pull out ahead of you. You should be able to guess what the speed limit probably is, even if you don’t see a sign. You also need to be able to drive on roads you’ve never been on before. Driving up and down the driveway doesn’t count. Even if you follow all the rules, you still might get hit by some jackhole who isn’t doing what he’s supposed to be doing and your insurance rates will skyrocket through no fault of yours. But the odds of that tend to be lower if you drive defensively and don’t take unnecessary risks. On the other hand, if you are too conservative and are scared of driving on roads where you might encounter other cars, you may never get where you’re going (or not in a reasonable timeframe). Does any of this sound familiar? Try replacing “search engine optimization” for “driving a car”. Now substitute “other cars on the road” with any dumb or even legitimate thing you’ve heard webmasters gripe about. Part of being an SEO is understanding the consequences of algorithm shifts, dealing with the fact that competitors do shady things, pursuing strong ROI while also managing risk levels, knowing what pitfalls lay ahead and having some idea of what to do about them. Being an in-house SEO involves getting executive or company-wide buy-in and prioritizing tactics and resources. Being a client-facing SEO service provider also involves being able to convince clients to do things and, yes, even making sure they pay their invoices. Unless you’re an academic, that is part of being an SEO. Except Google keeps changing the algorithm. Except my clients don’t do what I tell them. Except my competitors engage in spammy paid link building practices. Except I have an e-commerce site and no one links to commercial sites. Except my crappy CMS keeps spitting out duplicate content. 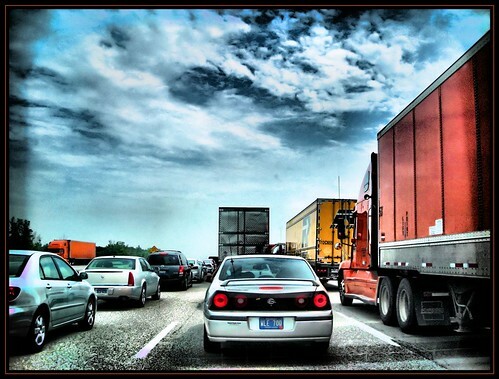 Image: “Traffic Jam” by K2D2vaca used under CC license. … Lack of connectivity in the Media 2.0 venue was driving me crazy, so I sneaked out to grab some wifi time at the Caribou Coffee around the corner. I ended up being a little late to this session, which is where Pew Research talked about the latest findings. I walk in as Lee Rainie (@lrainie), Director of the Pew Internet & American Life Project, is talking about the rise of the “internet of things”. We now get into surveys that asked experts to predict the future of the internet. Rainie says that previous survey respondents (who were asked to predict where we’d be in 2010) got some things right but there were also some misses. Before going into the results of the latest survey, Rainie explains that there were some methodology changes. Among them is that the new survey included new participants (not just previously questioned “experts”, but new people too). Furthermore, the questions were set up as tension pairs; rather than posing a prediction and asking respondents to agree or disagree, the option was now presented as A or B, and respondents had to pick which they agreed with more. Then they were asked to explain why. First question was based on Nick Carr’s argument: The internet makes us dumber vs. internet makes it easier to connect and get smarter. Most said it doesn’t make us dumber. Cognitive capacities will shift. Different skills are necessary in the new world. Not necessary to remember stuff, but critical thinking becomes more important. People who can sift through info will do better. There are new types of literacy. Fourth “R” is retrieval (reading, writing, ‘rithmetic and now retrieval). “Extreme Googlers” was a term that was mentioned to describe a new skillset. As networked individuals make decisions, we need to adapt and learn to search out info. People are people. Internet applies same tendencies. If you are lazy/distracted, the internet helps you be you. If you are an info omnivore, technology lets you do that better. Tech isn’t the problem; it’s inherent character traits of people. Performance of “information markets” is a big unknown, especially in age of social media and junk information. There will be pressure on technologists to filter good vs. bad stuff. What’s around the corner? The tension pair was: Hot gadgets are pretty evident today (no surprises) vs. hot new tech are not anticipated by many of today’s savviest innovators. Most answered that the hot new thing is not something we know about yet. Look what the iPhone did – an example of something we couldn’t predict. Innovation ecosystems will change: bandwidth/processing. Ecosystem will be different so hard to anticipate what will work there, what marketplace will work/how it’ll function. Anonymity will be a different thing by then. New definitions of anonymity. There will still be work-arounds: “Pseudonymity” will be available to people. Public disclosure will be separate from than registration requirements. Anonymity not same as confidentiality and autonomy. The latter will replace yearning for anonymity. Rise of social media is as much a challenge to anonymity as authentication requirements. Reputation management and “information responsibility” will emerge. Being part of SM, showing some part of yourself and your social graph, will allow people to figure out who you are… it’s not the tech itself that discloses who you are, it’s the social practices and people’s ability to just look at info YOU are sharing. Next question deals with impact of internet on institutions. Will institutions change/become more responsive? Most experts agreed they would change. The “future” is unevenly distributed – businesses will change most; governments least. Data will be platform for change. Even if institutions don’t change, social media will facilitate work-arounds. Tools in consumers’ hands will help figure out ways around these barriers erected by institutions. Citizen engagement/crowdsourcing will force change in market place. Efficiency and responsiveness aren’t the same thing. More people responded anonymously when saying they are worried about corporate power. Institutions will resist. Rainie shared there that there were quite a few criticisms about this question as lumping different types of “organizations” (nonprofits, governments, businesses) into a single category didn’t make sense. He concedes this point. Next question deals with impact of internet on reading, writing, rendering of knowledge. He points out that young people don’t think of texting as “writing”… it’s just conversation. So it’s not fair to use “text speak” as evidence that literacy is suffering. More experts agree that the internet will improve reading, writing, rendering of knowledge. People are doing more reading, writing now so it has to be better. Participation breeds engagement. Pressure to get better driven by concerns about reputation, etc. Reading/writing will be different in 10 years. “Screen” literacy will become important. Content creation will be done in public. It’s not better or worse, just different. These are public acts, so feedback will compel people to get better. Networked information models are changing creation and consumption process. So metrics of consumption will change (become richer/broader more complex). Next question: Will internet continue to be dominated by end-to-end principle? Most of the respondents think it’ll remain the same. Openness has its own virtues and its served us well so far. Those who disagreed weren’t arguing for the end of this paradigm. It wasn’t a value judgment; rather they were predicting that there will be pressures to regulate (including from users who want to avoid bad experiences). Next question was about the semantic web. Answers were fairly even split. Comments were along the lines that the semantic web won’t take off until there’s a killer app for it. The speaker now rushing through slides are breakneck speed and it’s hard to catch any details. Next two slides are about the internet’s influence on human relationships and something about the millenials. The latter dealt with opinions that millenials will continue to be very enthusiastic about information sharing even as they move onto other phases of their lives. Q: Is there a correlation between literacy and broadband adoption? Rainie says this is a really interesting question. No direct studies of correlation were done but he throws out some related questions: What are the issues? Is it access/price versus no perceived need/interest? Sometimes it’s a knowledge issue – people who don’t have internet only know what media says about the internet (it’s a dangerous place full of scams, etc). They don’t want/need it because they don’t know what it is. Others think it’s a tech issue. They are afraid of the technology/computers. What’s needed to get next increment of new users may be combo of tech support/hand holding and public education about what the internet is. What is the internet? Rainie says it’s personal, participatory, pervasive. Of those who self-report as using the internet, 93% have email. This percentage of email users has stayed pretty constant. Even when only 50% of population had internet, 90% used email. He goes on to say that maybe we need to rethink how we define the Digital Divide and access issues. How do you count people who use only mobile web? Does having an internet-enabled mobile device lead to the same level of access? Q. What’s the future of the the Web? Rainee thinks Chris Anderson is onto something with freemium idea/model. He says the media world frequently gets slammed for being slow to embrace the internet, but that this isn’t a fair characterization. He says it’s the advertising world that hasn’t figured it out; editorial side of things has innovated tremendously. Not fair to knock the editorial side of publishing for not getting it or jumping on opportunity fast enough.